Signature required for UPS delivery? Thread: Signature required for UPS delivery? The confirmation emails I get from UPS about my Tom Bihn packages always 'say signature required for package delivery', but my package was delivered this afternoon and the email from UPS says 'left at front door'. I'm a bit concerned as my flight home was delayed until tomorrow due to the weather. I'm hoping nobody steals it or it doesn't get soaked in the rain. Has anyone else had this issue with UPS or are signatures not really required? If the sender sent it with Signature Required, then someone has to sign for it. They are not supposed to leave it by the door. Unfortunately, not supposed to and actually does are two different things. I've had plenty of packages (not TB ones thankfully) that have just been left on the doorstep without a signature, even though the paperwork says it should have had one. Pretty much the only time I've ever had to sign was if I was home at the time, or if COD, taxes or Duties were due on the package. And that's not just UPS, Canada Post, Fedex, etc. all do it. Sadly...yes....UPS rarely ever has me sign for something, when when it says "signature required". Our local UPS also has a nasty habit of lying about where they've left things. "Front Door" could mean the actual front door, the bottom of the stairs (we lived on the third floor), the letter boxes, the rental office. I've had more than one package where it said "signed for by resident" and I couldn't find the package. Hopefully your delivery goes ok and doesn't get stolen. Is there anyone you can contact to have them pick up the package for you? For UPS deliveries, from TB and others, I almost always change delivery, through UPS website, to a UPS collection point conveniently close to home or work. This helps avoids any question of will anyone be at home or whether it is safe to leave it unattended. The delivery to a UPS collection points is even occasionally a day quicker than home delivery. Requiring a signature is a UPS service that can cost between $5 - $15 and, in our experience, most folks find it more annoying than helpful especially now that more delivery options are available if one uses UPS MyChoice or the collection points. First of all, no one received the box. Second, the building is obviously an office building. There is a sign on the door that says hours are Monday to Friday 8:30 am to 5 pm. I returned to the office - and my box was outside the door. Big sigh of relief. USPS also left my box of ink on top of the mailbox outside the gate of my building. The box would have gone easily inside my mailbox. Their notification said they delivered it to my front door. Here is what were in the box: Yeoman L verde + small Q-kit burnt orange - my first ballistic burnt orange. 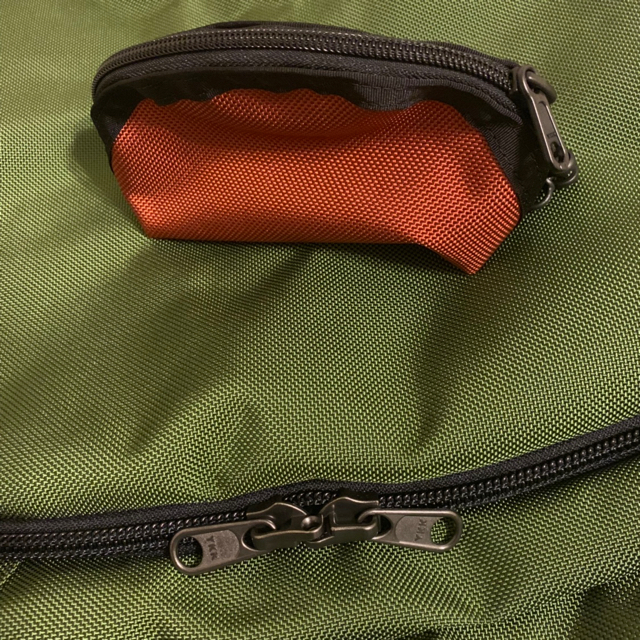 I had a mini- Q-kit in ballistic verde, and been wanting a bag in of this material and color. Happy dance! Last edited by Walker; 02-01-2019 at 04:57 PM. Darcy and Tom Bihn: thank you for allowing UPS MyChoice and delivering to UPS locations on your packages. I use it all the time! Some shippers restrict this option and it drives me nuts. TB Stuff: Cadet (steel/iberian), Pilot (verde/steel), Synapse 19 (Black/Wasabi), Synapse 25 (New Nordic/NW Sky), Swift (Aubergine/NW Sky), Makers Bag (Black/Steel), Aeronaut 30 (Black/Zest), Aeronaut 45 (Black/Ultraviolet). Is that a possible restriction from the shipper? If so, I learn something new. But anyway I totally agree UPS My Choice and selection of UPS pick up locations is easy to manage and my preferred secure and hassle free delivery option. Maybe I have been lucky and never done business with a shipper who has applied such a restriction. Yup, Costco restricts this option for sure. I've been really tempted to get a box at the UPS Store, but for now, most Amazon packages can go to the lockers, companies that ship various/unknown/local carriers go to work, and everything else either goes home if it will fit in the neighborhood USPS package locker, or diverted to Fedex or UPS pickup locations. Eventually, I think I am going to have to go with a box at the UPS Store. They already know my name when I walk in the door! Edited to add: or, a package locker that sits on our porch that can be bolted to the house or concrete. Last edited by featherwitch; 02-02-2019 at 10:59 PM.